Hey all! Today we're going to reveal a bit more up our skirts here at Gun Media and IllFonic about our actual DLC plans for the game, beyond what you've already been informed. While dates are tentative, this should give you all an idea of what is currently in the works/on the docket for Friday the 13th: The Game at this time. I know we have been pretty quiet in terms of the Xbox not getting patches or being delayed but it is really because there happens to be no good answer we can give the community that fixes the problem with delays. The reality is that, as of right now, the cert process on Xbox takes the longest of the platforms and if something happens it starts the process over again. Through most of August we were dealing with the Memory Leak issue that was causing Xbox players to crash consistently. It took weeks to track down the issue and took a majority of our engineering resources. We also got engineering support from outside sources as well. By mid-end of August we were able to go into cert with the memory leak fixed but ended up failing because of lobby issues and a few other crashes/stability. While it was far more stable that the July patch, the right call was to fix the issues. At the end of August we released the patch that is currently live on Xbox. We got a ton of great feedback and were able to resolve a number of bugs quickly which we were then able to roll out on PS4 and PC but ended up getting blocked on Xbox. I know you are not going to like this answer but the patch was blocked by the Disc Build that was going through cert. Aside from time, for Xbox, we can only have one thing in cert at a time so we had to wait for it to clear. Disc cert was a little different as well, we had to first submit the exclusive DLC content in one cert and then the disc version that had the game and DLC as a bundle in a subsequent cert. There were no failures in cert but we did bottleneck ourselves with multiple back-to-back certifications for a couple of weeks. Again, there is nothing we can do about the cert process but right now we are moving forward with bug fixing rolling at ASAP on any platform but new content coming out together on all three platforms. This is still tough to do but this is what we are going to attempt. Let’s talk about single player. Currently we are behind on the Summer date. There are number of reasons why this is, but it all boils down to making sure we are not releasing new content while still having issues with the core game. There were a number of issues we needed to address with the games stability prior to committing additional resources to making Single Player happen. We now feel we have turned that corner and have doubled down on Single Player to try and catch up. We have hired additional people, are working with contractors and even diverted others working on other tasks to help. We have also decided to take a look at Single Player and we are breaking it into a number of different experiences that can be released independent of one another. This way as soon as one thing is done we can launch it without having to wait on everything else. I also want to address the misconception that certain content we launch affects single player. It doesn't. An artist working on outfits is not the same person that is programming AI. The designer setting up scripted events for single player is not making the new Jason models. What does impact Single Player are the bugs and stability issues; that AI programmer may have to shift to fixing a bug occasionally. The designer may have to shift to fix balance or gameplay bugs on maps. This is why we are delayed. We made the decision to fix rather than add new stuff which again, is what caused the delay. Just in time! Gotta go fast! REAL edit: I wasn't expecting that you would reveal your future plans for the game to us, @GunMedia_Ben. That is very kind of your part! And I didn't expect things to be added so fast either. I hope you and the others succeed! I understand, but it's so hard to not be completely disappointed right now.... Guess it'll be even longer before I play this game again. Makes sense. Thank you for the frank update and useful roadmap graphic. Good luck squishing bugs and getting through XB cert! So.. single player coming early 2018? Appreciate the road map for what's expected to come though. 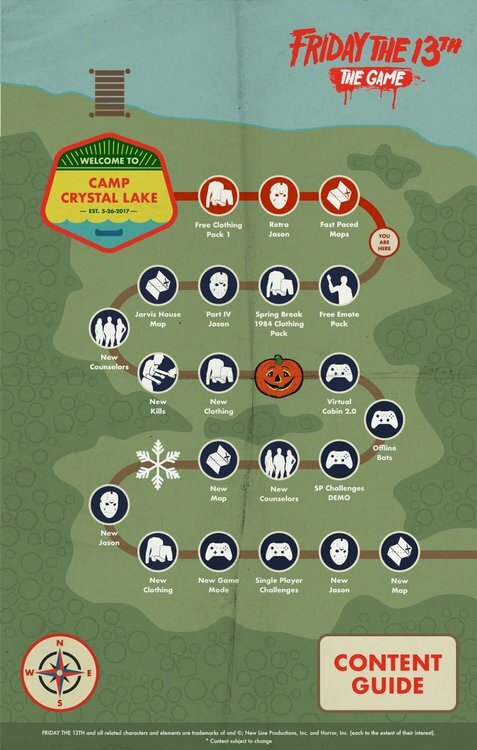 Forget the delay post I said was gonna happen and que the pumpkin and snowflake graphics to take the brunt of pissed off f13 nation!!! UNREAL! F'nLOL? Not gonna lie, it's a tad disappointing it's taken this long for us to be given an update on singleplayer. Oh sorry xbox users, you are effed, but we have you money already, we want that new disc player money. there is no way you can spin it, thats the bottom line and the truth. the game is still broken as hell, and no fix is coming soon. you took weeks in august to find the memory that you know about before launch. what a freaking joke. @GunMedia_Ben While they're not actual release dates, I do appreciate the attempt to better clarify on "soon" while not committing to actual dates with this road map. Is it safe to assume that some things will come together? Like the Spring Break DLC and emotes (not actually, just an example)? Additionally, a lot of people have been asking and it seems like the question is being overlooked, but will outfits be mix-n-match-able? Like can Tiffany wear the bikini top with her OG short-shorts? It seems there's a lot of confusion on this and we'd love clarity. According to Wes on Twitter, single player encompasses the Virtual Cabin, Offline Bots, and Challenges. So we will be getting parts of the SP experience just after Halloween. So many new counselors jesus im impressed, but to be honest. I was really hoping to see a "pamela killer" circle appear somewhere Well dreams being dreams i guess. So, offline bots somewere after Halloween & Singleplayer sometime after Christmas? Wow I wasn't expecting all of that, I'm glad to see that we're getting new content before Halloween.? Technically speaking, the Virtual Cabin 2.0 and Offline Bots are forms of Single Player. Maybe not what was expected, but still forms of it! @lHeartBreakerl, you have 2 comments saying the same thing. Try to report your second one. 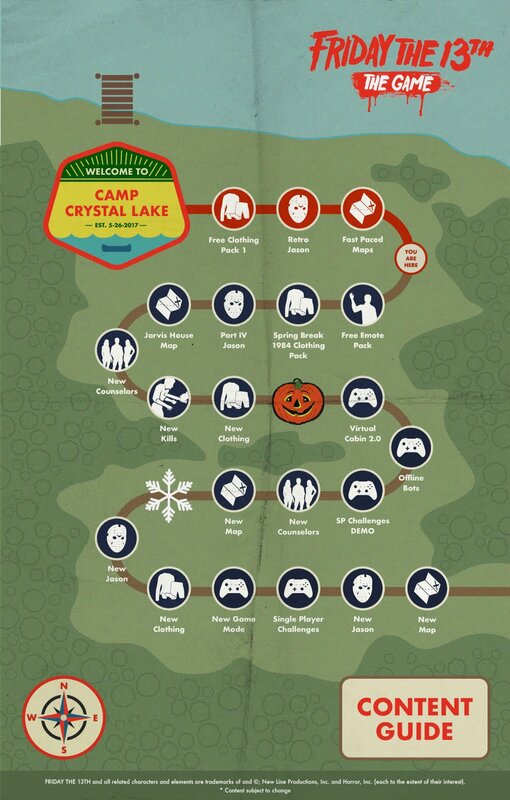 I really hope that the costume packs aren't a measly 2-3 skins per counselor, like I'm hoping more 5-6 per counselor. I didn't even notice. Thanks for the heads up. If all goes as planned. Nothings set in stone so try not to get your hopes up. I hate to be that guy. But making a deadline is something I've yet to see from Gun. I'm guessing we get Manhattan during "Fall" and Jason X/Grendel Map/Single Player "Early 2018." Not so much misdirection, I feel they laid everything on the table. Maybe it's more like they didn't meet the time frame they wanted to. At least there is s general schedule of content to come and the patch should help the broken aspects. We shall see. Since the full SP release has now officially been delayed with the image, I'm not tooo afraid. But we never know, you're right.